During the early 1960s, a series of events helped Americans to become more aware of the harmful effects of pollution. In 1962, Rachel Carson published “Silent Spring,” a bestseller that shed light on the negative impacts of indiscriminate pesticide use in America. Carson was critical of the chemical industry's claims regarding the impact of synthetic pesticides on human health and the environment, and a society that did not allow individuals and groups to question government policy on what companies could release into the environment. That same year, Wisconsin native Gaylord Nelson secured a seat in the U.S. Senate and made it his mission to raise awareness about environmental issues. With a “national teach-in on the environment” on April 22 of that year, Nelson appealed to university students across America in an effort to bring environmental causes into the national spotlight. Toward the end of the decade, in 1969, a fire on Cleveland’s Cuyahoga River shed light on the problem of chemical waste disposal. During that time, it was common for factories to pump pollutants in lakes, rivers and the air with very few legal consequences. Inspired by the Vietnam War "teach-ins," Senator Nelson announced the Earth Day concept in Seattle in 1969 and urged the country to get involved. News of the initiative spread throughout the country and rallies in major cities sparked congressional support. An estimated 20 million people demonstrated across the country to show their support for Earth Day. Earth Day was officially enacted in 1970 to raise public awareness about environmental issues and help transform public attitudes. The newly enacted holiday inspired a decade of change, which resulted in the passage of the Clean Air Act and the creation of the U.S. Environmental Protection Agency. Since 1970, Earth Day has grown to become a global initiative with more than 1 billion people participating. With participation growing each year, Earth Day has quickly become the “largest civic event in the world,” according to the Earth Day Network. 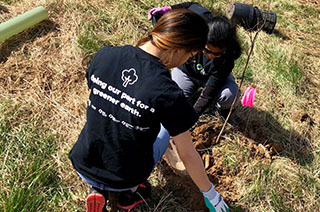 In celebration of Earth Day, WGL Energy Services, Inc. (WGL Energy) employees, family and friends will volunteer with The Chesapeake Bay Foundation to help plant 1,000 native trees and shrubs on April 27, 2019. Deadline for sign up is Friday April 19.